For some, the mention of artificial intelligence (AI) summons images of robots running amok as humans valiantly try to bring them under control. But the reality is much less dramatic. In numerous ways, seen and unseen, AI already pervades business and society. And its advocates claim it has almost limitless potential for enriching and improving human lives. Whether you agree or not, one thing is sure: AI is big business. Little wonder businesses in Australia are scrambling to join the party. Google Australia managing director Jason Pellegrino estimates in the next 15 years AI-driven automation will deliver about A$2.2 trillion in economic growth in Australia. The impact on the workplace will also be profound. Just as every silver lining brings a cloud, market experts Adzuna predicts that one in three Australian jobs are at risk of being automated by the year 2030. Reflecting this trend, the National Australia Bank (NAB) earlier this year began replacing 6,000 workers—one in five members of NAB’s workforce—with AI-driven software applications that handle increasingly complex tasks. At the same time, though, the bank flagged plans to hire 2,000 more people with technology skills. But like it or not, Artificial Intelligence (AI) and its sub-specialties Machine Learning (ML) and Deep Learning (DL) will continue to shape and change our world. So then, what exactly are they? How do they work? And what practical applications do they have. Here is a primer to help you grasp the basics. Artificial intelligence enables machines to perform tasks that usually require human intelligence, such as perceiving, reasoning, learning, interacting with the environment, problem solving, and even exercising creativity. The machine learns from data it receives by identifying patterns and relationships within the data itself. It does this by applying logic and reason to gain an understanding from very complex data. 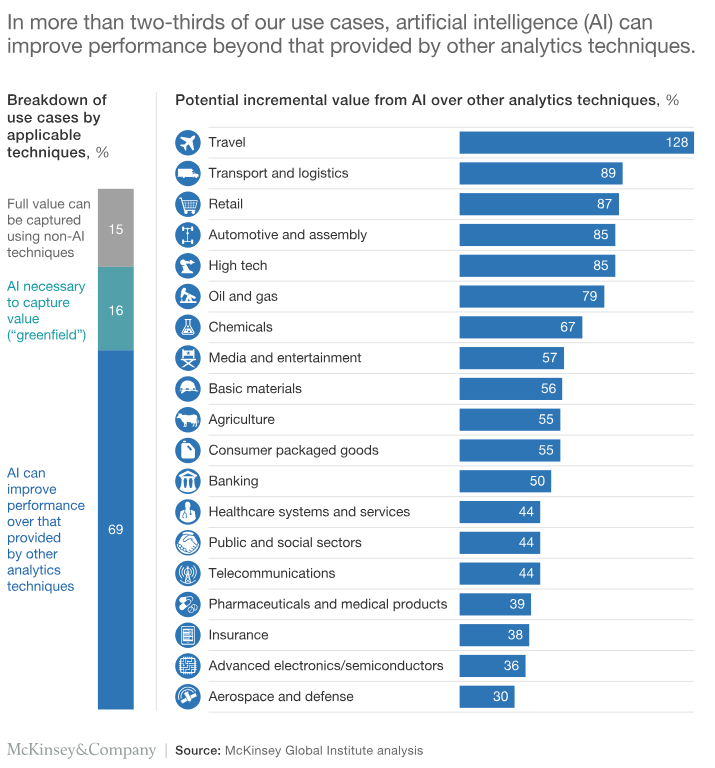 Putting it another way, AI enables a machine to ingest massive amounts of information, extract key features, determine a method of analysis, write the code to execute the analysis and produce intelligent output—all through an automated process. Understand typical trends or behaviours for customer financial transactions and spot anomalies in an account’s spending data to identify potentially fraudulent behaviour. Capture short- and long-term variability in data to improve forecasting of energy consumption. Examine animal track images and group them by species type to support wildlife conservation efforts. Determine if nodes on a raw CT scan are malignant or benign. Transcribe customer call centre voice messages to text for detection of sentiment and further analysis. Offer personalised recommendations to online shoppers by matching their interests with other customers who purchased similar items. Tell a software application to generate a report on sales revenue predictions without having to run the reports yourself. Get summaries of everything that has been analysed from a large document collection. The most recent advances in AI have been achieved by applying machine learning to very large, diverse data sets. Machine-learning algorithms basically detect patterns. By detecting patterns in vast amounts of data, they learn how to make models, predictions, and recommendations. They do this instead of using a rigid set of commands programmed by a person or team of people based on the information available at a specific point in time. 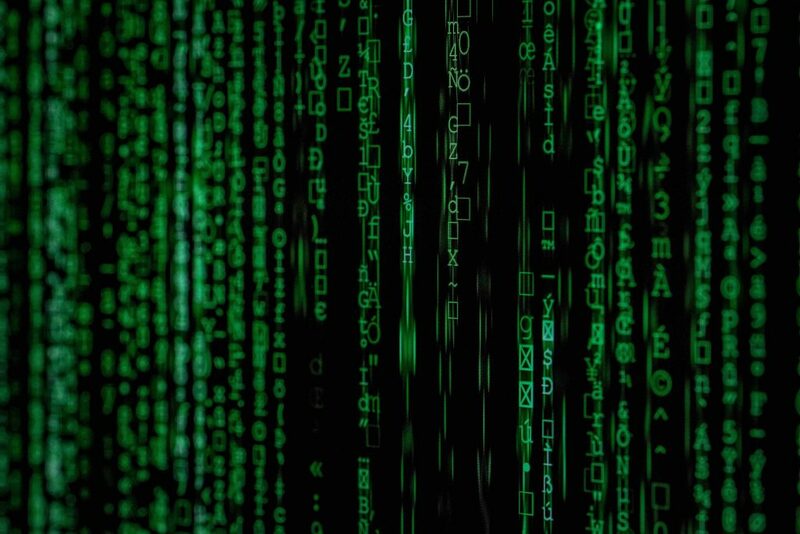 A huge differentiator is that the ML algorithms continually learn and adapt as they process new data. There are four primary methods of machine learning. In supervised learning, the “machine” (aka the algorithm) is taught by example. Sample questions and answers are provided, the machine identifies logical patterns, then it applies the pattern to solve similar problems. Determine if an individual might default on a loan. Predict when equipment might fail. Identify patients at risk of developing a medical complication. Enable a system to take action based on verbal commands. Read an email, tweet, or text in a document. Identify and tag objects in a picture. Identify fraudulent transactions before they do damage. Determine if a person is who they say they are. Segment customers based on their preferences, history, behaviour, and intent. Determine what advertisements or messages to show customers based on their actions and intent. The algorithm is provided some data with defined (labelled) answers along with additional data that is not labelled with the answer. In other words, the some of the input data is tagged with desired output (answer) while the remainder is untagged. Semi-supervised learning is used where there is too much data or subtle variations in the data to be able to provide a comprehensive set of examples. In this case, the provided inputs and outputs provide the general pattern that the machine extrapolates and applies to the remaining data. Practical applications include image and speech recognition and web page classification. Machines study raw data to find patterns, getting better with experience (though never becoming autonomous). The algorithm determines correlations and relationships by parsing the available data. Unsupervised learning is modelled on how humans naturally observe the world—drawing inferences and grouping like things based on unconstrained observation and intuition. As our experience grows (or in the case of the machine—the amount of data it processes) our intuition and observations change and/or become more refined. Identify products frequently bought together. Determine what product or service to offer next, such as recommending news articles a reader might want to read based on the article she or he is reading. Detect unexpected or non-standard behaviour by an individual. Identify fraudulent or criminal network activity (cybersecurity). Determine new grouping or customer classifications based on known and unknown factors, including behaviours, influencers, and networks. Algorithms that can work with and exploit a given set of rules to move towards a desired outcome. It is the equivalent of teaching someone to play a game. The rules and objectives of the game are clearly defined. By applying the rules, exploring different actions, and observing resulting reactions the machine learns to exploit the rules to create a desired outcome. Stock and pick inventory using robots. Playing chess or Go. Optimising pricing in real time for an online auction of a product with limited supply. Optimising the driving behaviour of self-driving cars. Deep learning is a type of machine learning that can process a wider range of data resources and requires less data pre-processing by humans. It can often produce more accurate results than traditional machine-learning approaches, although it requires a larger amount of data to do so. The sophisticated analysis of deep learning is achieved through “neural networks”, so called because they loosely mimic the interconnected structure of the human brain to provide a many-layered functionality. These “neural networks” are so sophisticated, that the path a machine takes to reach its conclusion is not yet readily understood. Deep learning uses huge, self-improving neural networks—only possible and more widely accessible because of recent advances in computing power. Track visual changes to detect defective products or maintain buildings and equipment. Power chatbots—algorithm-driven machines that conduct conversation via sound or text—that can address more nuanced customer needs and inquiries. As our brief review has shown, AI technologies are already available and they have immense potential. But for all that promise, they still have many limitations that need to be overcome. 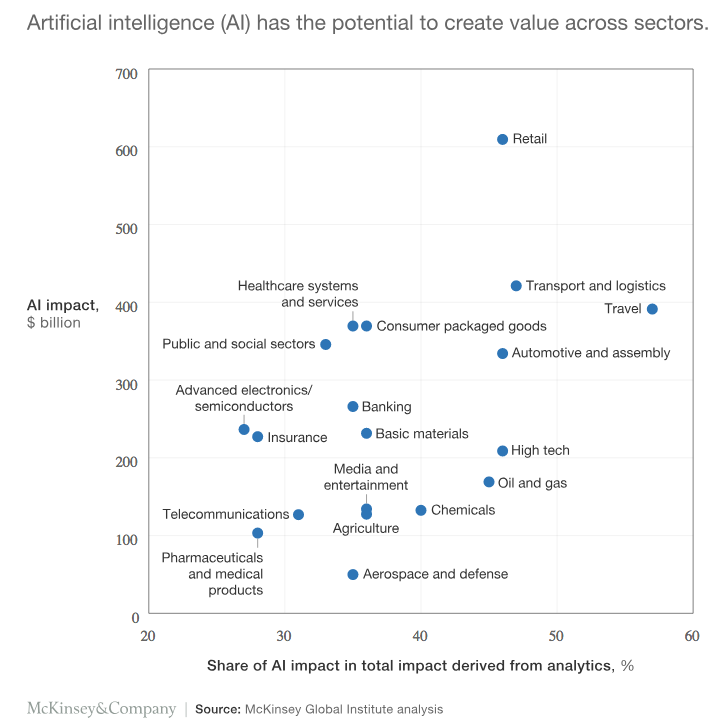 “So far, most of the progress has been in what is often referred to as “narrow AI”—where machine-learning techniques are being developed to solve specific problems, for example, in natural language processing,” notes a McKinsey report. As the power of AI grows, sensitive social, moral, and legal issues will also need to be addressed. There is also the expense and steep learning curve before AI can become useable in a business. This likely goes some way to explain why despite AI’s potential to add trillions to the global economy, its adoption rate so far is about four per cent, reports Fortune magazine. “No sector or business is in any way immune from the impact of AI,” declares Gerard Verweij, Global Data & Analytics Leader at PwC. Take a good look at your business and determine what strategic pain points can be eliminated using AI-based solutions. AI can provide predictive analytics for your business. It can help you automate tasks. Through examination, you can determine the right objectives for your business. Any new technology comes with risks, but the only way to master the technology is through using it and learning from your mistakes. You can take initiatives with smaller scopes and critically evaluate every failure. It will help you understand your risk factors and give you data to make better decisions in the future. To implement AI solutions in the real world, you need AI developers—a scarce resource. Developers then need access to scalable and affordable computational infrastructure that can support the necessary AI processing. Also, they need raw data and specialists for data labeling, model output validation and more. Building this AI infrastructure is time-consuming and costly. Most companies simply can’t afford to hire 100 data mappers in-house and implement the infrastructure to support them, but there are services available that make AI app development accessible and affordable for businesses. So you don’t have to build the infrastructure and the human capital from scratch. You can use these services to fast-track your AI efforts. To win in any technology war, you need the right people and the right culture. Hiring employees takes time. Building a good culture takes time. You need to invest resources to improve your chances. While it’s expensive to invest in new technology and new talent, it’s worth it. Doing so can transform your business.